Love story-telling from a close-range low-altitude aerial perspective. Extensive experience in post-production for aerial photography and I have a full time video editor/producer on my team to assist with video post-processing. 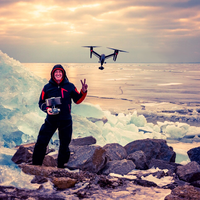 Have attended a SUAS Thermography Certification course and I also teach drone workshops, safety, photography, and the business of being a drone pilot for hire.